As I've said before, some of my favorite DC Comics of the Dan DiDio/Geoff Johns era have been written by Peter Tomasi. Aside from being a great writer, pairing thrills with emotion, and also routinely using gore with care and adeptness, Tomasi has demonstrated himself exceptionally versatile. It's no small thing that a writer who first made his splash for me on the cosmic Green Lantern Corps then went on to write street-level Batman and essentially define the Damian Wayne character after Grant Morrison, nor that Tomasi could then go on to equally succeed writing the superheroic Superman. 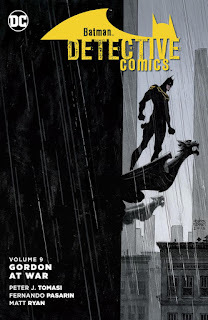 Tomasi demonstrates that versatility again in Batman: Detective Comics Vol 9: Gordon at War, two more stories starring Jim Gordon as an unlikely Batman, following Tomasi's Batman Jim Gordon/Justice League team-up in Detective Comics Vol. 8: Blood of Heroes. As I wrote in that review, these Detective stories that offshoot from Scott Snyder's Batman: Superheavy are totally unnecessary, completely ignored by the main story, and for that reason that Tomasi can make them stories as good and worthwhile as they are is all the more impressive. On art, Detective reunites Tomasi with artist Fernando Pasarin, bringing the same admirable down-to-earth realism to the psychedelic "Superheavy" as he did to Guy Gardner's family life over in Green Lantern Corps. Notably, Tomasi doesn't put Jim Gordon into the "Superheavy" robotic Bat-suit until the last of his five chapters in this book, meaning a majority of this book sees Gordon as a (mildly) more down-to-earth Dark Knight. The first story, "The Bronze Age," has Gordon and Harvey Bullock solving the mystery of a Gotham serial killer; the second, through some timeline theatrics, has Gordon rejoining his war buddies in Afghanistan to determine who's hunting them. Equally superheroics don't come into play until the last chapter; the majority of Gordon's foes here are good ol' "normal" Gotham crazies. In this way Tomasi distinguishes Gordon at War as more than just a "Superheavy" tag-along, but rather an alt-take on what "Superheavy" might have been under different stewardship. Blood of Heroes, with its Batman robot fighting a bombastic Joker robot, could be read as "Superheavy"-light, but Gordon at War is a reinterpretation of "Superheavy" with perhaps a more faithful eye on Gordon's gritty Year One roots. In Bronze Age, especially, Tomasi underscores how well Gordon knows the people of Gotham and the soul of the city, to an extent that having Gordon as Batman feels almost more comfortable than Bruce Wayne in the role. Of the book's two stories, I give "Bronze Age" a slight lead over "Gordon at War" if only because Gordon never dons the Bat-armor in "Bronze Age" on its own. The story is a gripping police procedural, not so much whodunit as "where will he strike next," with victims imperiled throughout. Tomasi writes Gordon and Bullock well as partners even despite the strangeness of the Batman costume between them. Additionally Tomasi packs the story with historical fact and takes the audience on a tour of Gotham's apparently extensive statuary collection to boot; all the clues and sleuthing here make me eager for Tomasi to take on the Riddler one day. Tomasi never reveals the villain's identity, letting his insanity suffice, a controversial choice but one that I think makes "Saint George" that much more frightening. "Gordon at War," in the same vein, works slightly less well only because, in terms of the aesthetic Tomasi has set up, the Superheavy Batman fighting a super-strong mummy in the last chapter comes off a tad silly. On the way there, however, is Gordon often un-costumed, and negotiating both assassins and army politics both in Gotham and Afghanistan, which is indeed a story that can only be told with Gordon-as-Batman and couldn't be told with Bruce Wayne. Tomasi's timeline makes zero sense, positing a mustachioed Gordon fighting in Afghanistan in flashback and having most of his unit still being there now, but this remains a story that feels faithful to the character and I'm glad Tomasi had a chance to tell it. As is true of most good Peter Tomasi stories, both "Bronze Age" and "Gordon at War" are notably gory, but as I've described before, Tomasi uses gore so tastefully and in ways so necessary to the plot that it never offends or feels exploitative. "Bronze Age" underscores the villain's mania as he tortures his captive victims and at one point pulls a bloody Batarang out of his own back; "Gordon at War" has its own victims stripped of long swaths of their skin. Fernando Parsarin's late-story image of a bullet-ridden mummy burning alive must have been a perverse delight to draw. Pasarin's straightforward style, as mentioned, brings a realism to the book. Pasarin's work is so straight-on, as a matter of fact, that he even draws Gordon's ears bulging at the sides of his cowl; if this in some respects ruins Gordon's chance at the legendary Bat-silhouette, it better represents what Gordon would actually look like without artistic artifice. One conceit is that Pasarin shortens Gordon's Bat-ears perhaps more than depicted elsewhere, giving Pasarin's Gordon-Batman a not-coincidental similarity to Daredevil Matt Murdock. Batman: Detective Comics Vol. 9: Gordon at War ends with Detective Comics #50's "The 11 Curious Cases of Batman," a riff on classic Batman comics covers, and the Batman: Rebirth special. The Rebirth issue is tied not at all to Detective (and it's printed also, more properly, at the end of Batman Vol. 10: Epilogue), and so it seems a final reminder of the troubles of identity that the New 52 iteration of Detective Comics has had, an also-ran of the Batman title till the end. It's all the better, then, that James Tynion has given Detective its own, seemingly winning, identity in Rebirth, and I'd as soon have seen the first new issue of Detective reprinted here. But the good news is that Peter Tomasi and Fernando Pasarin end the New 52 Detective Comics on a high note, a mercy DC Comics's namesake title surely deserves. Sounds like something I really ought to read. I'm with you 100% on Peter Tomasi, CE. I'll buy pretty much anything he writes. When it comes to every character he's written in the DCU, he just seems to get it - he knows exactly how to write them, and write them well. I enjoyed this little run. Tomasi really made the most out of a status quo that so many were eager to hate. It didn't try to shake everything up with every issue; instead it just told stories about Jim Gordon, the detective, the person, the father. Surely there's a market for a trade of TV's Gotham-themed comics stories, like they did for the Lois and Clark show way back. One of these "realistic" Gordon-as-Batman stories would be worth including.